Home Cottages The Inn Guest House Dining Weddings & Events History Activities Contact Us Book Now! 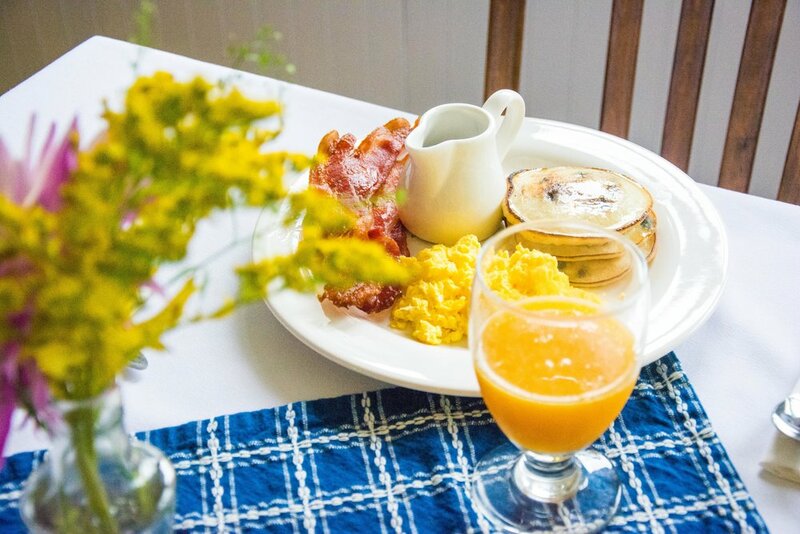 HomeCottagesThe InnGuest HouseDiningWeddings & EventsHistoryActivitiesContact UsBook Now! 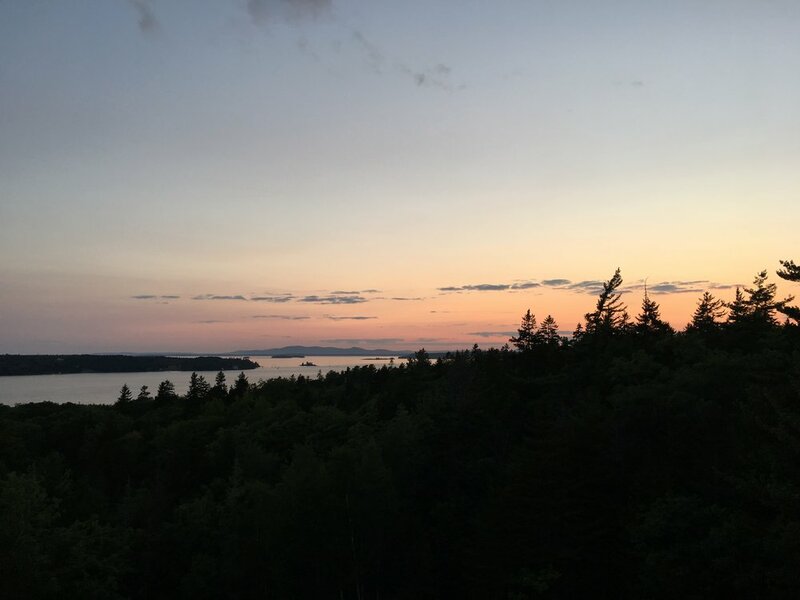 The Oakland House is a resort colony of vintage cottages, a communal guest house and 130-year old inn on 60 acres on Eggemoggin Reach, overlooking picturesque Pumpkin Island to the right and the iconic Deer Isle Bridge to the left. We offer a restorative haven for guests in search of breathtaking sunrises and sunsets, hikes to gorgeous overlooks, cozy nights by the fireplace and silence disturbed only by the call of loons in the nighttime. 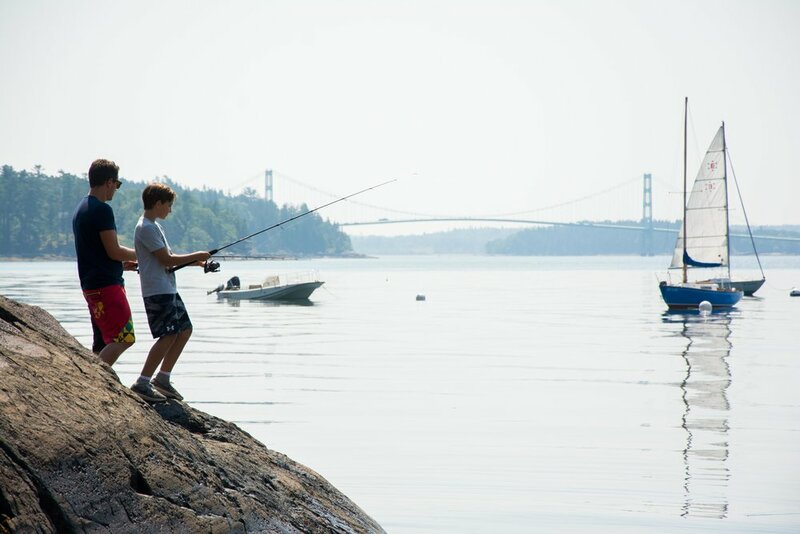 We’re also ideal for restless nature-lovers who come to paddle, hike, bike, fish, sail and explore Acadia National Park. Or play tennis, waterski, ride a horse and climb a rock-face. Maine = vacation, however you define it, and the Oakland House is at your service. 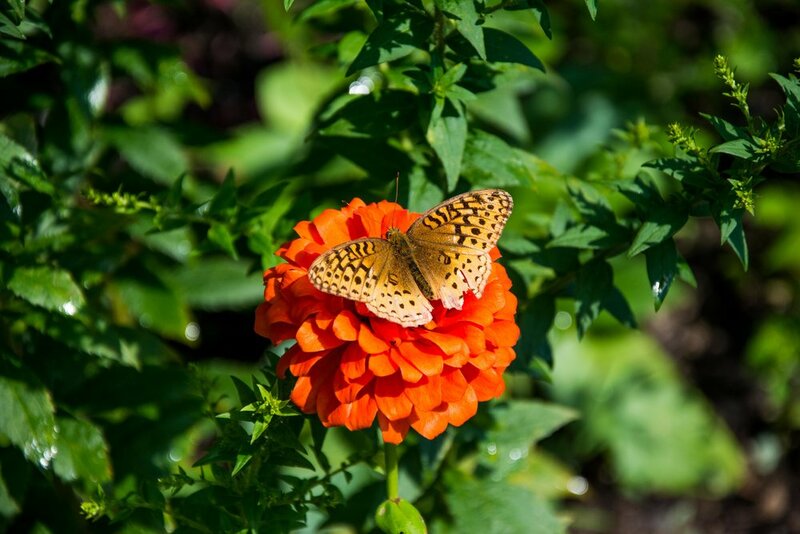 Each of our eight cottages has its own personal charm. 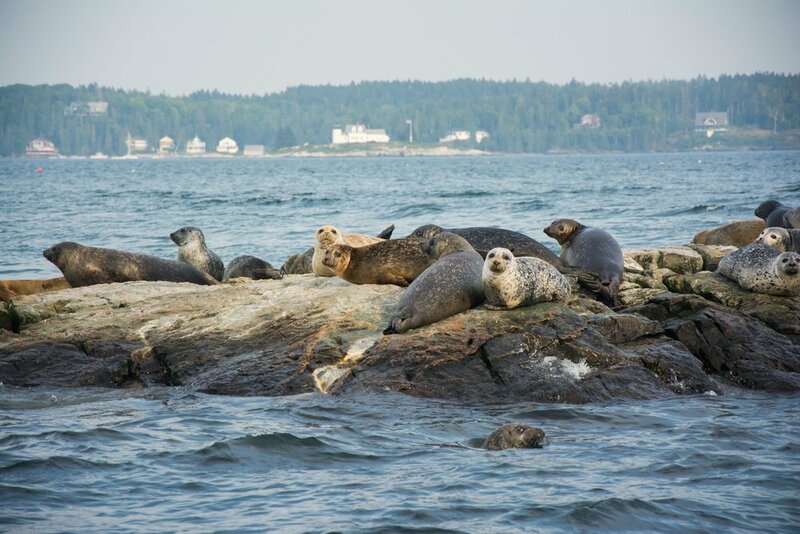 Some sit right on the shoreline, others perch overlooking the Reach, two are dog-friendly, all have cozy granite fireplaces and vintage Maine appointments. Our communal guest house has a following all its own among travelers seeking no-frills but comfortable visit in which they are likely make friends among fellow guests. The broad porch overlooking the lawns and gardens are especially welcoming, and the well-appointed shared kitchen encourages home cooking. Private beaches, onsite hiking trails, equipment rental and and our experienced concierge team to assist with all sorts of arrangments make an adventurous Maine vacation a possibility. The Oakland House has a long tradition of weddings by the sea, either under the oak groves of Cathedral Field or in a traditional event tent on the great lawn. 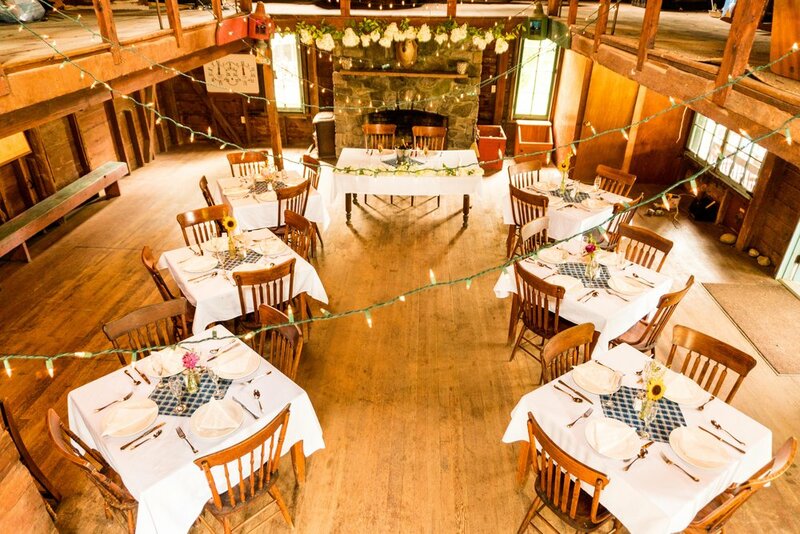 The Barnacle, our large barn with a granite fireplace and high rafters, provides another gathering place. Called the Barnacle, our cozy barn also houses weekly kar and is also the home of our weekly a event and open-mic musical events. Family reunions, writer’s retreats, artist’s colonies, we have options for all sorts of special occasions. Our Oakland House event planner will be happy to help make the arrangements.